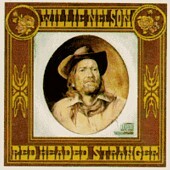 Red Headed Stranger is a concept album with mystic and religion overtones. Recorded for under $20,000, and financed solely by Nelson, it became Willie Nelson's Columbia Records debut and his first double platinum release. Lonely and isolated, the music flourishes under the bare bones production and raw guitars - not to mention Nelson's classic behind-the-beat voice. Powerfully sobering, Nelson is at his best with just the light acoustic guitar and minimalist percussion. Songs like "Time of the Preacher" and "I Couldn't Believe It Was True" are as tender and true as they come, while "Denver" and "Remember Me" shuffle and bounce with a more proactive rhythm section up front and Nelson's guitar moving at a swifter pace. The bonus tracks, "Bach Minuet In G," "Can't Help It (If I'm Still In Love With You)," and "A Maiden's Prayer" find the band full on, picking up the pace and breathing a whole life into the music. Especially "Bonaparte's Retreat," the final track on the album, which is a bouncy, danceable cut that is as country as they come. Nelson earned his reputation for solid songwriting and the ability to touch a listener deep down inside with this album. Not to mention his place in the rock 'n' roll and country hall of fame's. Here is a true piece of country history that will live on forever. I'll give it an A+.